Siberian Exile: Blood, War and a Granddaughter’s Reckoning by the Lithuanian-Canadian author Julija Šukys tells the story of the author’s grandmother, Ona, deported to deepest Siberia while Lithuania was under occupation by the Soviet Union, as well as a shocking discovery she made during her research: that her grandfather, Anthony, had been involved in overseeing massacres of Jews during the subsequent occupation by the Nazis. Deep Baltic presents three chapters from the book. You can also read an interview with Julija Šukys about the book on Deep Baltic, here. A few years after Ona’s death in 1996, I began to transcribe the letters she’d written from Siberia to her children. I wanted to know everything about her life there, but I found the letters silenced more than they told. From her Spartan cabin, my grandmother wrote only about the small and mundane; cows, pigs, and gardens were among her favorite subjects. She said almost nothing of the journey by cattle car, of widespread starvation, of taxes paid in agricultural products, or of life under Stalin. This frustrated me, and I felt the creeping pangs of regret. Why had I waited so long to do this? Still, I kept at it. I transcribed in spurts, then packed up the finished product, and sent it to Ona’s elder daughter to read over and, if necessary, to correct it. At the very least, I figured it would make a nice gift to my family. The corrected letters returned by courier on the morning I was leaving on a research trip (unrelated to the Siberian letters) to the Kent State University Archives in Ohio. While tempted to bring the corrections with me, I thought better of it and left the package on my desk at home for fear of misplacing the letters during my trip. Nor could I delay my departure to read them. I’d already postponed my research a week to avoid arriving on the anniversary of the Ohio National Guard’s 1970 shootings of student protestors, when the archive would be packed with journalists. I had the rare chance of both the funding and the time for travel, so I had to go and make the most of it. When I arrived, two boxes of uncataloged papers awaited me. The cartons held unsorted piles of files, seemingly random envelopes full of yellowed clippings, and stacks of handwritten journals. While sifting through one of the boxes, I came across a notebook labeled in Lithuanian, “Father Joseph (1880–1953) in Siberia.” A handwritten message clipped to its cover read, in English: “This material was found on a shelf in the Archive, unidentified, on January 2, 1994. It has been placed with these other materials in hope that the next Lithuanian researcher can identify it for us.” The seventy- two-page typescript of a taped conversation recorded near Chicago in 1977 told the story of Father Joseph, a priest exiled to Siberia in 1941. The woman interviewed in the transcript, I discovered to my astonishment and even shock, was my grandmother. When Ona came to visit the priest’s nephew, a local journalist enthusiastically agreed to interview her and to record the conversation on tape. But when he began the task, it became clear that things were progressing with some difficulty, that he didn’t have much time, and what’s more it appears that the tape he used produced a very poor recording, and not everything can be understood. Ona told twice as many stories as were recorded. In short, it all ended up a bit of a mess. Later, it was necessary to transcribe the tape, which proved to be a huge job. Not everything could be understood, some parts were skipped over, and so on. In addition to all that, Ona is a peculiar character. She remained almost completely uneducated, but Siberia hardened her, she became quick-witted and wise. She survived very well and was 73 (at the time of the interview). She rejoined her husband and three children in Canada. I’ll send you the text. Kazys’s note had warned, the text grew increasingly fragmentary, with ellipses riddling the conversation where the typist ostensibly hadn’t been able to make out the recording. How likely was it for such a convergence to occur? What were the odds of my coming across Ona’s interview like this, by accident? Even if, on some level, I knew these questions were impossible to answer, I decided to ask them anyway. At the university where I work, a good-natured statistician named Larry agreed to take a shot at my query. “Brace yourself,” I wrote, and then I told him the story of finding the interview transcript. It certainly seems to be an amazingly unlikely sequence of events. However, life is full of events and, just by chance, some very unlikely things happen. Think about it this way: A “1-in-one-billion chance” is infinitesimally small. However, if there are 7 billion people on earth, then on average such an event would happen to 7 of them. Suppose I flew to New York City and went into a library archive, started flipping through documents, and found something about my paternal grandmother that had been misfiled. That seems so unlikely that I cannot imagine it could possibly happen. For one thing, my paternal grandmother was a housewife who lived a quiet life in Pilot Grove, Missouri. I cannot imagine that anyone would have written anything about her let alone something that might be archived. It would be even less likely to be misfiled. Now your situation is different. Your interest in Lithuanian history is probably, at least in part, due to your ancestry. That part is not completely random. You were looking at an archive at Kent State where . . . information about Lithuanians is stored, which makes it more likely that something about your grandmother might be there. You were specifically looking for information about someone [the Holocaust rescuer Ona Šimaitė] whose name was similar to your grandmother’s. Thus the fact a document about her might be misfiled in such a way that you might accidentally find it is more likely. What happened is certainly more likely to have happened to you than to me (or a random person). The email helped me see that events I had been thinking of as entirely random—first, my grandmother’s arrest and deportation and, second, my finding a record of an interview with her about those experiences—were perhaps not so random after all. Larry, in his statistician’s vocabulary, had described the stance that allows writers to notice points of overlap in the world. But despite being able to whittle what’s random away from what’s not, even the statistician appeared to be impressed by my find. In fact, these eerie coincidences happen with a weird regularity. In The Red Notebook, Paul Auster strings together a series of strange and unlikely convergences. I trembled with wonder and recognition as I read his tales of travelers showing up at exactly the right moment, of phone calls from supposedly fictional characters, of siblings unknowingly marrying one another, and of a birth father’s being found on what is simultaneously his birthday and the eve of his death. Were these occurrences miracles? Were they caused by something otherworldly? Could a writer really make these things happen simply by living? Or (as Larry would have it) was there a more pedestrian explanation that had to do with ways of seeing and being? Still, even now, I can’t shake this coincidence. Or rather, I can’t stop it from shaking me. In Everything That Rises, Lawrence Weschler too describes “being visited by similarly uncanny moments of convergence, bizarre associations, eerie rhymes, whispered recollections.” It’s not by chance, I think, that coincidence came into Weschler’s life precisely as he committed himself more fully to his writing. That was the moment he started moving through and seeing the world differently, opening himself up to it in new ways. Writers don’t create coincidence. They notice it. Perhaps my work has conditioned me to notice things like the notebook. And perhaps a series of unlikely though not entirely random events put that notebook into my hands. But maybe, just as Weschler wondered as he watched the ant-sculptor, something divine was at work that day in the archive. What I didn’t realize was that to write Ona’s book would mean writing Anthony’s as well. And that between those two lives I would find another eerie kind of fate in which the one paid for the crimes of the other—even before they had been committed. The Kaunas station teemed. Ona stood against a wall with a suitcase at her feet. She looked around, hoping to spot Anthony but also praying he wouldn’t be there. He was nowhere to be seen. Women and children abounded. They carried bags and linen bundles. A little girl watched in terror as soldiers dragged a husband from his wife. An elderly man answered and raised his hand but remained seated on his suitcase. He was impressive in his dignity and calm. Squeezing past a nursing mother and whimpering child, Ona made her way over to him. “Excuse me,” she said quietly, “but aren’t you from the village of P—?” The man looked up, startled at the mention of his hometown. “We’re family!” The priest extended his hand. Father Joseph hailed from one of the wealthiest families in Lithuania. As rumors of coming deportations began to circulate, the priest’s twin brother sensed he was in danger and fled to the West. Father Joseph, by contrast, refused to budge. Instead, he’d packed his bags and waited for Red Army soldiers to arrive and arrest him. As Ona and the priest talked, a string of cattle cars rumbled up a parallel track. This, not the passenger train, would take them east. Among bits of straw and traces of manure, Ona and Father Joseph staked out an area in one corner on the car’s wooden floor. Teenagers clambered atop shelves and set up camp by the small windows above. Soon the wheels began to turn. The car moved slowly past a prison camp with barbed-wire fences, through the church-spired capital and its new suburbs, into unfamiliar Belarus and finally Russia. “Where are they taking us?” Ona whispered to the priest leaning against the wall beside her. She knew the answer, though, before he’d uttered it. For four days and nights, the priest and Ona slept fitfully. Each rolled over only when the other did, since they were not only huddled against each other but also squeezed between the car’s wall and a mother with her three children. As the exiles rumbled eastward, birch stands and pine forests gave way to wetlands and then to a rolling landscape dotted with scrubby brush. They passed villagers tending gardens of cabbages, beans, and potatoes. Convoys stacked with logs trundled by on a neighboring track, testifying to mighty forests somewhere close. Soon children grew hungry and began to cry. Some deportees, including Father Joseph, had thought to bring food. Though he shared what he had, the priest warned his fellow travelers to ration carefully. Days passed, and with each sunrise, mothers assured their children that today there would be food, but as the hours slipped by and their bellies ached, the mothers’ promises showed themselves to be hollow. The children drifted off into fitful sleep. With each kilometer, the air in the car grew closer. A nearby woman became hysterical. Ona sat. She neither screamed nor slept. On the fifth day of travel, far from home, the cattle car’s door opened with a thud to reveal a soup cauldron some yards from the tracks. The priest, who spoke fluent Russian from his St. Petersburg student days, translated the guards’ instructions. “They’re letting one parent from each family off. You must leave your children on the train. Bring a cup,” he said, loud enough for all to hear. Childless adults, who had every reason to attempt an escape, had to stay put. Ona remained on the train. Soon, all around, famished children gulped watery soup from cups, jars, and bottles. Ona felt no hunger. In the faces of the kids around her, she saw those of her own, and in their voices she heard her babies’ cries. When she closed her eyes, she saw her daughters’ and son’s legs carrying them down the tracks as they called after her train. Father Joseph whispered prayer after prayer beside her. In time, she began to whisper too. In Ona’s train car, women organized to maintain as much dignity as they could and hung sheets around a hole cut in the car’s floor, so the exiles could relieve themselves in relative privacy. The sheets are a detail that appears in virtually every deportation memoir. Survivors also have told of bodies strewn alongside the railway. The dead, they say, were tossed out of the cars to make room for the living. Mothers, in particular, went crazy when forced to leave the body of a dead child behind. Ona, however, told nothing of such scenes—neither to us, her family, nor to the interviewer who recorded a lengthy conversation with her many years after her return. Perhaps she couldn’t see out to the ground from the corner she shared with the priest? Perhaps her cohort was luckier or stronger and fared better? Or maybe these were details she chose not to recall. The Soviet regime did not invent Siberian deportation. As early as the late seventeenth century, banishment to regions beyond the Ural Mountains had largely replaced the death penalty in Russia. Rather than beheading or drawing and quartering mutineers, murderers, and thieves, authorities exiled them instead. They marked the banished with slit nostrils, severed ears, brands, and tattoos so that, even if they escaped Siberia, they could never evade identification and humiliation. Eventually, punishment through exile targeted POWs, counterfeiters, military deserters, aging and infirm serfs, loan defaulters, and Old Believers deemed heretical for their rejection of post-reform Russian Orthodox dogma. Throughout the seventeenth, eighteenth, and nineteenth centuries, Siberian marches took up to two years to complete. Convoys of prisoners shackled in iron walked up to five thousand kilometers eastward through snow, marshland, and insect swarms. In 1863 barges came into use to transport exiles for part of their journey, but first they had to make it to the north-flowing river system on foot. Exile had a purpose besides simple punishment: Russia’s unwanted, destitute, and criminal elements were to settle the vast open land and conquer its native peoples—the reindeer herders, hunter-gatherers, fishers, and nomads—who had lived there for millennia. Officials hoped that a lasting, more recognizably Russian society would ultimately take root and grow on the steppes and tundra. But for this to happen, they soon realized that families—specifically, women—were needed. Hoping to engineer family units, the Russian government attempted to procure wives for exiles. They offered to buy indigenous Siberian girls at a price of 150 rubles per head. It didn’t work. Indigenous families refused to sell their daughters, though Siberia’s male peasants gave up their female relatives to exiles for 50 rubles each. But despite these and other incentives—tax breaks for first marriages and cash rewards for successful matches—by 1828, Siberian settlements still failed to thrive and for the same reason: a lack of women. Unlike Ona, who traveled over the Urals without her family, most women who ended up in Siberia in the nineteenth century were wives accompanying husbands into exile. Often these women marched with their spouses by choice, since being left behind as a convict’s widow could be a much harder fate than a life in exile, so strong was the stigma of Siberian punishment. In other cases, women ended up there because of crimes they had committed, though few—around 20 percent—had been convicted for serious offenses. The journey for female exiles was far more perilous than for men making the same trip. When stopping for shelter in fetid stations along the way, both women and children risked sexual attack. The region’s long-standing gender disparity, with men massively outnumbering women, changed dramatically under Stalin. The special settlements of the 1930s through the 1950s were overwhelmingly female, since most of the wives of the so-called enemies of the people (like Ona) ended up there. Although life was very difficult on the settlements, it was still a far cry from the Gulag, and female exiles had much better chances for survival. By 1941, the year the USSR officially entered World War II, the ratio of women to men in some rural areas of the Soviet Union had widened to 6:1. Staggering Soviet military losses in World War II would only heighten the disproportion. Ona’s closest male confidant in Siberia was the elderly priest who traveled with her into exile. In contrast to my grandmother’s seventeen years, his banishment was comparatively short. Father Joseph was allowed to return to Lithuania after only four winters, when the chairman of the Presidium of the Supreme Soviet of the Lithuanian SSR intervened on his behalf. Why the chairman did so is unclear. Some say he was repaying an old favor; others are more cynical and believe the priest’s release was calculated. Indeed, archived documents confirm that upon Father Joseph’s return to Kaunas in 1944, authorities tried to recruit him as an informant for the KGB. When they failed, the secret police planned to exile the priest once again in 1953. Father Joseph died before it could happen. 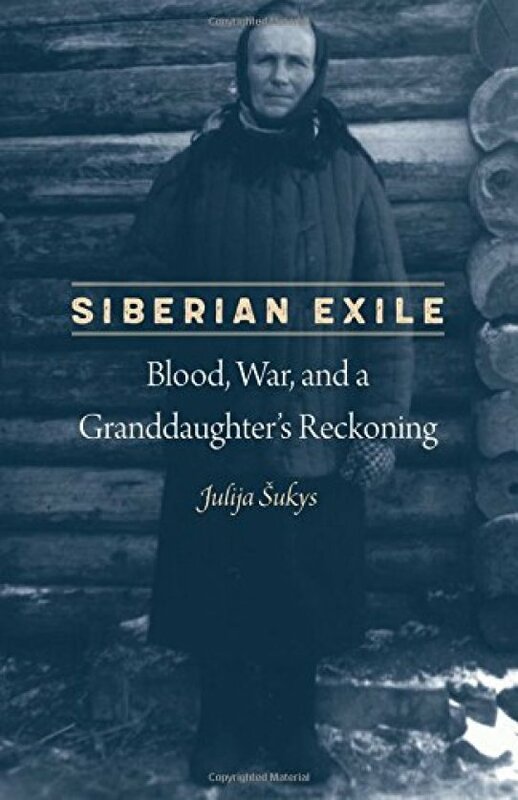 Excerpted from Siberian Exile: Blood, War, and a Granddaughter’s Reckoning by Julija Šukys by permission of the University of Nebraska Press.